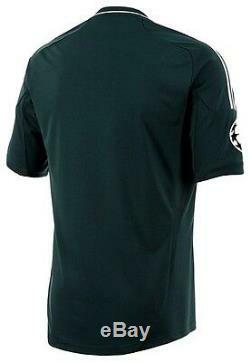 ADIDAS REAL MADRID UEFA CHAMPIONS LEAGUE THIRD JERSEY 2012/13. Celebrate Real Madrid's 110 years of success. Cheer Los Blancos whether or not you're in Santiago Bernabeu with this official jersey. This is the jersey Real Madrid will wear during some UEFA Champions League play. This green color is rarely seen on the legendary club this is only second time in the club's history - 1965 was the last. Time the club wore green. Pinstripes add a retro look. Real Madrid team badge, embroidered silver adidas logo and screened sponsor logo at front. The Real Madrid 110th Anniversary commemorative logo is printed on the shirt's inner upper back area. There is an applied felt official Champions League Starball patch and 9 times trophy winner patch on the sleeves. 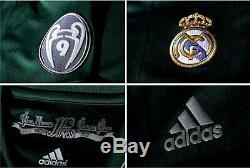 The item "ADIDAS REAL MADRID UEFA CHAMPIONS LEAGUE THIRD JERSEY 2012/13" is in sale since Thursday, February 9, 2017. This item is in the category "Sports Mem, Cards & Fan Shop\Fan Apparel & Souvenirs\Soccer-International Clubs".